There was a kind of inevitability in Fabio Capello's England reign ending in tears off the pitch. When as a player he scored for Italy against Bobby Moore's England at Wembley, who'd have thought it'd be the Italian and not our World Cup winning captain that would coach the team one day? Ciao e Grazie. Lessons learned? One can well imagine the John Le Mesurier-style FA mandarins goading the firebrand Fabio on points of principle to surprise us all with his resignation. I met Fabio by invitation at Wembley about a year ago. I knew of his "my way or the highway" approach to management - but face-to-face, I was struck by his simplicity and with reference to the England job, his foreignness. Here was a Latin taking on the FA, an Anglo-Saxon church of football - and expecting co-operation throughout. Fabio talked simply on his humble beginnings in a small northern Italian village and his strong-minded journey through football in beating a career-threatening injury as a youngster. When the FA appointed Capello in the wake of the Steve McClaren debacle, he was hired for his incredible trophy haul in Italy and Spain. But nothing was taken into account with reference to how, where and when he won it. Because Capello managed mostly Latins in a southern European environment. The instinctive group mentality of that culture played well with his "do what I say" instructions. Furthermore, those players were on wages a fraction of the level of our boys. Cry God for Harry, England and St. George! ﻿So Fabio's proud and confident inflexiblity was always going to be gobbled up by our individualistic club-focused millionaires. "They really insulted me and damaged my authority. What really hit me and forced me to take this decision was the fact the much-vaunted Anglo-Saxon sense of justice, as they are the first to claim that everyone is innocent until proven guilty. In Terry's case, they gravely offended me and damaged my authority at the head of the England side, effectively creating a problem for the squad. I have never tolerated certain crossing of lines, so it was easy for me to spot it and take my decision to leave." We're best without him, I know. Let the coronation of Harry Redknapp be arranged and with his arrival, let the basics about football come to the fore. There's too much apparatus and apparatchiks at the FA spoiling our broth, and it's gone on too long. Disband Club England, appoint 'Arry and this time, do it without Sir Clive Woodward! Remember Greece at Euro 2004. Simples. Italy stands for love, England for freedom. It is a clash of cultures. I'm upset for how Perfida Albione treated Capello. I think it’s important to remember that culturally, Fabio Capello is worlds apart from most of the England squad. Everything about him is different, from his approach to football to his general attitude to life. What do we know about him as a person? His big hobby away from football is classical music. He listens to it for hours on end in the evenings. He is a devout Roman Catholic, and prays twice a day. He has gone on record expressing his admiration for the current Pope, and has close links to right wing politics in Italy. He couldn’t be more different as a person to many of the characters who make up the England squad. I’m Welsh, and I’m an outsider looking in at the events of the last few days. From where I’m sitting, the FA’s approach to the whole thing has been pathetic. They should either have chucked John Terry out of the squad completely, or kept him on until after the investigation concludes. Letting him stay in the squad while stripping him of the captaincy stinks of indecision and cowardice on the FA’s part. For what it’s worth, I’m in no doubt whatsoever that Terry made racially offensive comments. He strikes me as a snide, thuggish character, which football would be better off without. If I was in Harry Redknapp’s position, I’d rather carry on with the building work at Spurs. Here is the reality: Most of the England squad are very ordinary, and are not going to win, or come close to winning a World Cup or European Championship. Rooney and Gerrard are the only players who would be serious contenders for a World XI. Neither Harry Redknapp nor anybody else can change that. Massive cultural change is needed if England is serious about winning a major trophy. It’ll take a generation to bear fruit, but for now, massive change is needed at grass roots level: in the schools, in the way we bring up our children (getting fat playing computer games won’t make us a better footballing nation), in the approach leading clubs take to bringing through home-grown youngsters, to addressing the lack of opportunities to break through to first-team level in the Premier League. 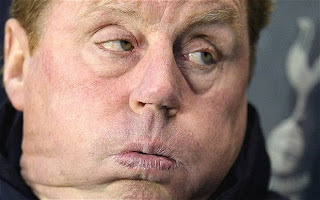 Looking at the players available to Redknapp this wouldn’t be a challenge I’d want. At Spurs, he can bring in players from whichever country he likes, provided the money is there, and it would only be a matter of time before they won major trophies. At England, he is restricted by who is available through birth right. The press and will inevitably crucify him in time for failing to work miracles with these over-inflated egos who much of the media seems to believe are far better than they really are. The Spurs job is much more appealing.